This community drama project was undertaken by Neston Players to commemorate the 200th anniversary of the local Ladies Day in Neston - an annual procession to celebrate the Neston Female Friendly Society. Gail was initially approached by Neston Players to facilitate a meeting to discuss ideas on the content and structure of this piece of theatre. She then mentored the team of local writers and directed the show - a full evening of drama / comedy / music all rooted in local history. The show played to sell out audiences in May 2014. 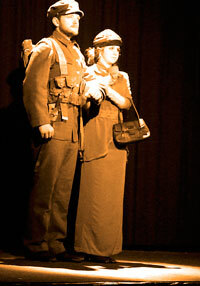 Visit the Neston Players website for pictures and videos of A Walk Through Time. Copies of the script can be obtained direct from Neston Players. I think this was, without doubt, the most unusual evening of pure theatre it has been my joy and pleasure to witness. A group of 7 writers all from Neston Players, under the watchful eye of fellow writer and eventual director of the play, Gail Young have been meeting since September 2013 to write, cast, rehearse and then present this unusual and highly entertaining evening. As with all great things – it started off in a very small way when at a meeting volunteers were recruited to co-ordinate a brief piece to contribute to the celebrations of the 200th Anniversary of Ladies Club Day. Then, like Topsy, “it just growed” to the full length play we were privileged to see. The play tells the story of the formation of the Neston Female Friendly Society which was formed in 1814 as a means of mutual self-help for women – their motto being “Bear ye one another’s Burden”- up to the present day by means of 15 vignettes visiting modern-day Neston, to the Boer War, 1st & 2nd World War and Afghanistan – all in one evening. I was a little worried that there would be ‘in jokes’ that, not coming from Neston, I would be unable to appreciate. There were, obviously and appropriately, a couple but the piece was good enough to stand alone and enjoyed by ‘in-comers’ and locals alike. The group had also secured the services of Hip and Harmony, a ladies acapella choir, and Steve Daintree a local musician and songwriter, who were a pleasure to listen to and who added wonderfully to the general mood and tone of the whole thing. As with all true theatre we were laughing out loud one minute at a Committee Meeting held in 1906 which was SO funny and some simply wonderful facial expressions, and near to tears the next transported back to a military hospital in France in 1915 – with again exceptional acting and facial expression – and that apron! The set was a simple black curtained set with appropriate props, and very, very many congratulations on the costumes which, without exception were superb – military uniforms were exceptional – the committee ladies in 1906 a joy to behold – oh that hat! - and the attention to detail of the differing states of Nurse Walker’s apron denoting the passage of time, and the state of battle was superb. Acting and facial expressions throughout were very good, we heard every word and it would be impossible and grossly unfair to name any one person above another. My only slight criticism was that some of the cast did not ‘ride the laughs’ so unfortunately we missed some lines. It did not spoil it one jot – I was just sorry to miss anything! My very warmest congratulations to anyone and everyone connected with this highly unusual and enormously entertaining evening – it was a superb evening – thoroughly enjoyed by your capacity audience – so more congratulations on full houses over your entire 4 day run. Thank you SO much for inviting me – I feel honoured and privileged to have shared the whole experience with you.